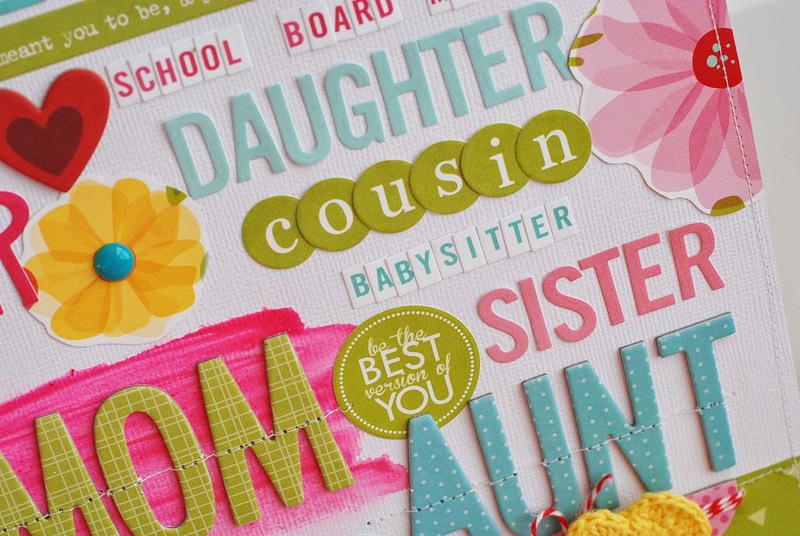 Let's celebrate National Scrapbooking Day Bella Blvd style! For the last two years I've created an All About Me project for Bella Blvd's National Scrapbooking Day Extravaganza! It's a great reminder to create about yourself. 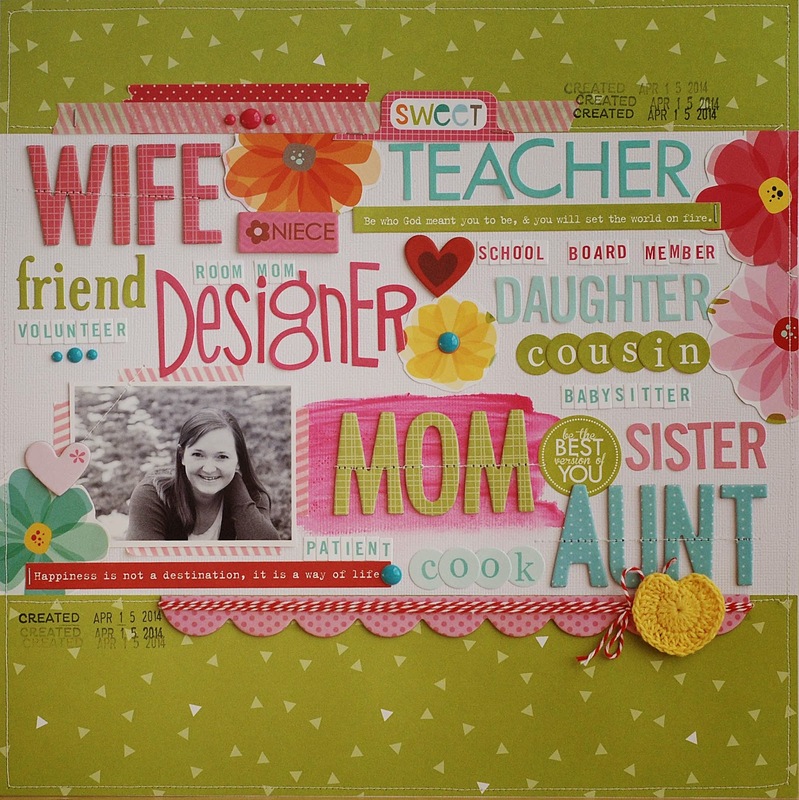 As a mom I wear many different “hats” I decided to create a layout featuring all the different titles and jobs I have. I went a little letter sticker crazy to get all of the titles on there. With so many words on this page I let the words serve as my title and journaling. The Bella Blvd Design Team was also asked to answer 5 questions about themselves. 1. What are your top 5 supplies/products that you cannot scrap without? 2. What to you listen to while you scrap? TV, music, or do you do your best work in silence? My scrapbooking area is in a corner of our main living area so I’m usually creating with several other people in the room. I always have my ipad on my desk and one ear bud in my ear. Most of the time I’m catching up on my favorite TV shows. I’m going through a bit of a Masterpiece Classic phase. Call the Midwife, Downton Abby, and The Bletchley circle are amongst my favorites. 3. What snacks and/or drinks are beside you when you're scrapping? My favorite snack while I’m scrapbooking is chocolate covered cinnamon bears. Have you tried them? YUM! It’s also not uncommon to find a bowl of almonds on my desk either. 4. When do you do your best scrapping? Are you a morning scrapper, a late night scrapper, or do you find time during the day? Most of my scrapbooking is done during the day. I like my sleep in the mornings and I’m busy with kids activities and bedtime in the evening. So, I spend a lot of time at my desk during the day when the little ones are playing. 5. Where do your layouts go once you're done with them? In albums, in piles, or shoved in random places? When I’m finished with a layout it goes into a pile in my closet. When the pile gets too deep I divide them into albums. I have a current album for each of my kids and a family one. By the time I actually put my layouts into albums I could fill 3 or 4 albums at a time. Now, are you ready for letter sticker mania? Thanks so much for stopping by today! Make sure you hop over to THIS post to enter a giveaway for a $20.00 gift certificate to the Paper Issues Store! <3 you're so sweet Heather! Thank you! Aline, I appreciate your sweet comments so much! 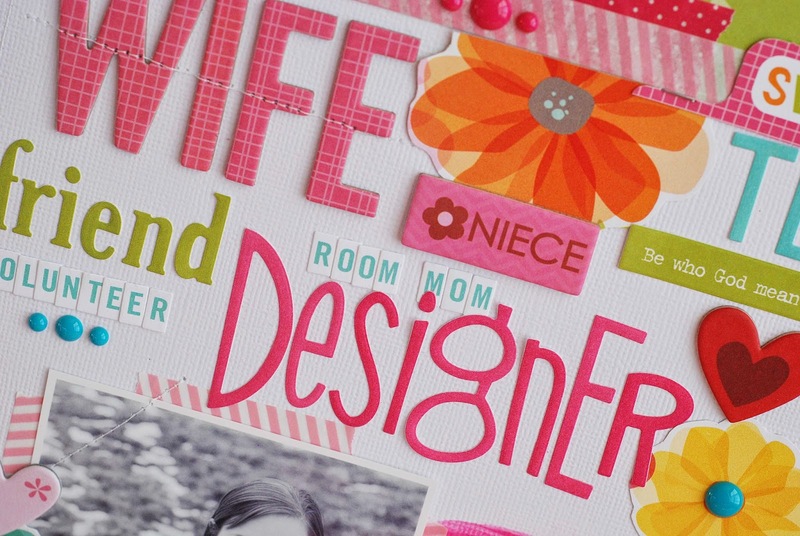 Love this idea for a layout, and you did it perfectly! Thanks Keathe. I love this idea too. I've done it a few times. I love to see how the "titles" change over the years.